G888 and winning innings frm Hodge. He scored 84 and remains not out. #HoSakayTo Karachi k gham mein shareek zarur hona. Is this what they call "fuzzy math"?---???? Love you IK RT NomyPti: Karachites wallas.... ???? Yeah... 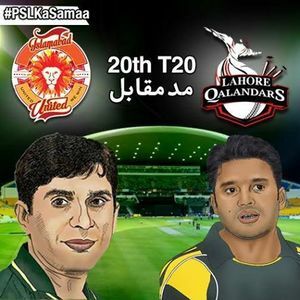 It's a big "Test Match" for Lahore Qalandars... ???? #LahoreQalandars were told that this is a must win game. But for whom that wasn't made clear! مورخ لکھے گا کہ بزرگوں (مصباح) سے جس نے بھی ٹکر لی، وہ پاش پاش ہو گیا۔۔!! لاہور چقندروں کے مالک کی ایکٹنگ ہی ختم نہیں ہورہی??? ?